All of this is lovely, looking forward to 0.2 . Good point, didn’t think about this. Wings would be the wrong choice concerning realism because that would force the ship to fly as fast as a plane or jet. Rotors underneath the ship body may be a solution. I’m pondering if the hover mechanism will be visible at all. it looks like both guns point outward. I personally would want to put as much metal slugs directly in front of me, where my enemies are, not to their right and left. on a more subjective note, I think the refined and aerodynamically looking body of the ship conflicts a bit with the minimalistic look of the engines. 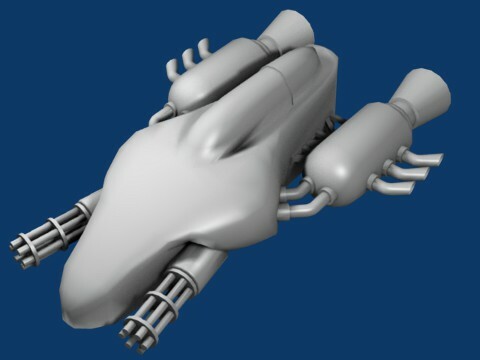 why would I bother building a aerodynamically sophisticated body and then stop and just bolt some engines to it which happen to lie around in the workshop? another idea regarding the guns: will there be a mouse/keyboard input mode comparable to 3d shooters (wasd keys to fly the ship, mouse arrow for aiming)? The final sprite will occupy 1-2% of the whole playfield size. Details like the guns therefore won’t count as much as they do in the 3D rendering above. There will be different muzzle layouts according to the new weapon upgrade feature – well, not new to shmups but new to Nordenfelt 🙂 These layouts will have different shot spread angles and firepower. You will be able to config your weapon as you like, depending on the upgrades you collect. Concerning aerodynamics: Sharp eye, man! The “lack of speed” in the game (< 100mph) renders aerodynamics less important. You are right, the engines are rather chunky. 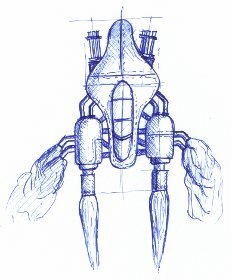 But that's something I really like about steampunk design: brute force technology combined with organic shapes. The mouse/keyboard combo is already included in version 0.2 (WASD = steering, mouse buttons = fire, bombs, etc.). Mouse aiming is a possible feature. I'll have to test if it fits into the gameplay. Anyway, it sounds promising. Thanks for the idea.